Pardee Homes’ Las Vegas Division received four Silver Nugget Awards from the Southern Nevada Home Builders Association earlier this month. The longtime homebuilder received Silver Nugget Awards for Best Design &Architecture, 2,001 to 3,000 square feet and priced from $300,001 to $500,000, for Keystone Plan Two and Best Single Family — Detached Home, $551,000 and up, for Escala Plan Two. New Home Advisor Maria Serna was named Sales Person of the Year, homes under $300,000, and Pardee Sales Manager Traci Sexton-Hall was recognized as Sales Leader of the Year. 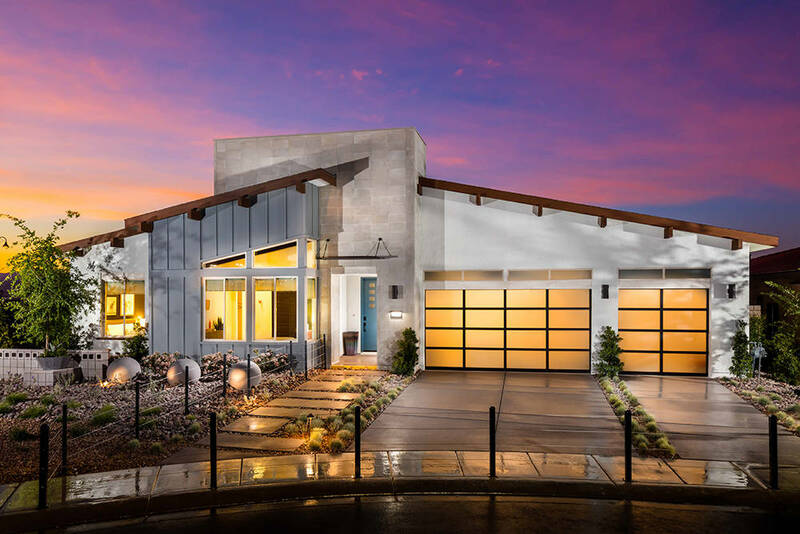 Pardee Homes’ Mid-Century Modern Escala Plan Two D features standard sloped ceilings, clerestory windows and three-bay garage in a single-story design that measures 3,063 square feet. The home includes three bedrooms; 2.5 baths; a modern, open kitchen; dining area; great room; and game room that all connect to the outdoor living area via 15-foot-wide stacking doors. Designed by Bassenian Lagoni Architects, with interiors by millennial designer Bobby Berk of Bobby Berk Interiors + Design, Escala Plan Two D continues to influence new home designs from Pardee Homes in the Las Vegas market. Mid-Century Modern architecture also influences the design of Keystone Plan Two, a flexible single-story home with angular rooflines, transom windows and generous outdoor spaces that connect easily to indoor living areas. The home measures 2,816 square feet with four bedrooms, three baths, an entry courtyard, outdoor room, teen room and three-bay tandem garage. Located in the Skye Canyon master-planned community in northwest Las Vegas, Keystone is a collection of single- and two-story floor plans that range in size from 2,520 to 3,868 square feet with up to five bedrooms and up to 4.5 baths and outdoor rooms. Homes are offered in three distinct elevations: Nevada Living, Contemporary Spanish and Modern Farmhouse. “Pardee Homes is proud to have excellent homes and excellent people, and these Silver Nugget Awards are a reflection of our commitment to both,” said Klif Andrews, Las Vegas Division president. Serna has been with Pardee Homes for 10 years and is consistently one of the top sellers in the under $300,000 price range, and Sexton-Hall has more than two decades of sales experience in Southern Nevada. She joined Pardee in 2015 and coaches and trains Pardee’s team of New Home Advisors and manages Realtor outreach. Pardee currently is developing 13 new home neighborhoods valleywide, including Axis and Horizon Terrace South in Henderson; Escala, Montero, Solano and Strada in the Inspirada master-planned community in Henderson; Castle Rock and North Peak in Pardee’s Eldorado master-planned community in North Las Vegas; Camino, across from Eldorado; Summerglen, Meridian and Encanto in southwest Las Vegas; and Keystone in the master-planned Skye Canyon community in northwest Las Vegas. In addition, interest lists are now forming for Pivot and Strada at Pivot, both located in Henderson and anticipated to open this June. Pardee Homes’ Make Your Move Event, featuring special incentives on move-in-ready homes in Las Vegas and Henderson, is underway through Sunday, April 30. For information on Pardee neighborhoods and move-in-ready opportunities, contact a New Homes Specialist at 702-604-3332 or visit pardeehomes.com/move. Pardee’s New Home Gallery hours are 10 a.m. to 6 p.m. Tuesday through Sunday and noon to 6 p.m. on Monday.